Altar There are 2 products. PLEASE SELECT DESIRED SIZE FROM DROP DOWN MENU FOR CORRECT PRICING. 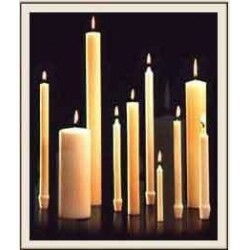 Cathedral Brand guaranteed and stamped 51% Beeswax candles are expertly crafted using only the finest pure natural beeswax for longer, cleaner and more dependable burning performance. Order plain or self-fitting ends. PLEASE SELECT DESIRED SIZE FROM DROP DOWN MENU FOR CORRECT PRICING. 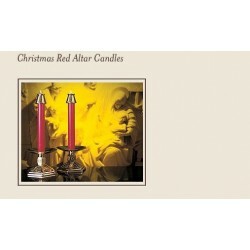 The rich, red color of these 51% pure beeswax candles will add a special holiday touch to your Christmas altar decorations.